Register for the Next Non-Commissioned Officers School (NCOS) HERE! The goal of the Noncommissioned Officers School (NCOS) is to provide the cadet with a foundation for the intermediate phases of the cadet training in Civil Air Patrol. NCOS stresses the fundamental aspects of instructional techniques, evaluation methods and intermediate leadership laboratory skills. The ability to instruct a class or make a presentation on a CAP related subject. The ability to drill a flight. The ability to evaluate another cadet in drill and in inspection. Expected performance: Each cadet will be responsible for all the material presented during NCOS. Civil Air Patrol is a national organization. As such, it is necessary that the cadet broaden his scope within the organization as his career develops. It is important that the cadet encounter qualified, competent leaders and instructors, and that he is allowed to interact with cadets from other units at their own peer group level. The Noncommissioned Officers School supplements and reinforces the Phase II training offered at the local unit. Through actual experience each cadet learns instructional techniques, evaluation methods and intermediate leadership laboratory skills. The cadet NCO in Civil Air Patrol is responsible for much of the instruction that takes place within the local unit, both on the drill field and in the classroom. With this in mind, each cadet makes at least one instructional outline and presents a class which could be used at his local unit. Specific instructional methods are covered prior to the assignment and resource material is made available. 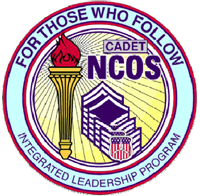 One of the most important goals of the school is to provide instruction for and direction to the evaluation process that a cadet is involved with as an NCO. NCOS stresses the importance of being positive and objective in the evaluation of other individuals. The school provides an environment in which the cadet tests these theories in a structured and controlled setting. Specific direction is given from the school staff at all times. The basic function of a CAP unit is to accomplish its mission with maximum efficiency. To reach this goal, each individual in the unit must perform his job promptly, correctly, and in accord with every other member of the unit. Such unity of action requires discipline. Discipline seems to bring a negative connotation with it, so the school redefines it in other terms. NCOS expands on these terms discussing group and self discipline and how they apply in Civil Air Patrol. NCOS is not intended to replace the unit training in drill and ceremonies, but rather to standardize and refine it. The intent of the drill and ceremonies instruction is to impart an understanding of the techniques necessary in teaching drill. In addition, it intends to create an appreciation for drill and ceremonies as a valuable and worthwhile training tool.